Using the information shared in the local dialogues, the July 2016 roundtable provided a forum for representatives from the four regions to voice concerns and issues at a national level. It also represent-ed an important opportunity for different communities, government stakeholders and mining, oil and gas companies to connect and share lessons learned and best practices. To provide a more national-level perspective, were stakeholders from the Government of Ghana including the Petroleum Commission, Ministry of Justice and Attorney General, Environmental Protection Agency (EPA), Commission on Human Rights and Administrative Justice (CHRAJ), the Ghana Army, Navy and Police, and Ministry of the Interior. The Roundtable included company representatives from the four regions including AngloGold Ashanti, Eni, Newmont, Shanxii Mining, and Tullow Oil, as well as the Ghana Chamber of Mines and private security provider G4S. Also in attendance were local leadership from youth, women and religious groups as well as WANEP and the Ghana News Agency. A total of 30 participants were involved at the event, which was staged at the Fiesta Hotel in Accra on July 28th, 2016. Fostering a more permissive and accepting environment for the implementation of the Voluntary Principles on Security and Human Rights (VPs) within Ghana is the principal goal of the Fund for Peace (FFP) program, implemented in partnership with the West Africa Network for Peacebuilding (WANEP-Ghana). The project aims to support the formation and rollout of the Ghanaian VPs National Implementation Plan, build the capacity of an informed local civil society, particularly on critical human rights issues that impact both men and women, and to develop a sustainable multi-stakeholder forum that can collectively create the conditions necessary for effective VPs implementation. Since July 2015, our 18-month program has focused on building the awareness and capacity of civil society — including local community members and civil society organizations (CSOs) — about the VPs, as well as more broadly peacebuilding and conflict prevention in extractives-affected communities of Ghana. This included developing pilot programs in four regions, to facilitate training, then dialogue that encourages constructive engagement between local government, communities, and companies. The activities aimed to help local stakeholders address grievances transparently, and ensure public and private security forces are acting responsibly and proportionately. Equipped with the knowledge and tools to monitor issues relating to security and human rights in these communities, as well as seeking to identify conflict drivers related to extractives, our program has provided civil society with a platform to better mitigate violence and potential for security force abuses in communities. This will feed into national level multi-stakeholder roundtables, designed to establish a practical working group of stakeholders to further VPs implementation across Ghana. 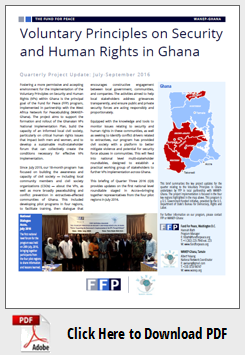 This briefing of Quarter Three 2016 (Q3) provides updates on the first national level roundtable staged in Accra—bringing together representatives from the four pilot regions in July 2016. One of the most valuable parts of the Voluntary Principles Initiative, is its ability to convene diverse stakeholders to find common ground on key human rights and security issues. This constructive engagement centers on the shared interests of government, company and civil society of promoting sustainable security and development within communities. For the company—reduced security risks mean a stable operating environment for their project to succeed. For civil society, it offers a chance to promote peace and prosperity for communities, while also ensuring their rights are protected. And for the government, it supports the objectives of both citizen protection and peaceable economic growth. While in theory these interests align, the reality on the ground is often very different. Communities and their representatives can feel aggrieved, distrusting of companies and government, and commonly as if they have not seen the project’s prosperity benefit their community or region, or that their concerns not taken seriously. By contrast companies or government may see the side of violence, crime and hostility from local actors that impact the safety of their personnel and assets, and jeopardize their operations. Establishing that mutual trust takes time. However, through clear rules and support to create a platform where constructive engagement can begin — sustained dialogue has the potential to address many of the underlying conflict dynamics. This program sought to achieve this through the creation of local dialogue platforms in Upper East, Western, Brong-Ahafo and Ashanti regions. For many stakeholders, it was the first time they had sat in a room all together with local leadership, government, company, CSOs and media, to talk about the issues facing them around the extractives sector. Discussions during the local dialogues staged in February and May 2016, were framed within the context of a forum of addressing security and human right concerns. The underlying conflict drivers also informed discussion, highlighting issues such as environmental degradation, compensation, unemployment and land disputes which can be triggers for violence. Using the information shared in the local dialogues, the July 2016 roundtable provided a forum for representatives from the four regions to voice concerns and issues at a national level. It also represented an important opportunity for different communities, government stakeholders and mining, oil and gas companies to connect and share lessons learned and best practices. To provide a more national-level perspective, were stakeholders from the Government of Ghana including the Petroleum Commission, Ministry of Justice and Attorney General, Environmental Protection Agency (EPA), Commission on Human Rights and Administrative Justice (CHRAJ), the Ghana Army, Navy and Police, and Ministry of the Interior. During proceedings, local representatives from the company, community and government in each region provided updates on key issues affecting their local areas. Across the regions, commonality was found in the propensity of underlying issues having the potential to escalate into conflict and violence, and result in security response and use of force incidents. This was considered more of a challenge than any human rights abuses being actively committed by security forces, which was seen as a follow-on effect. A second follow-up dialogue intended to narrow the focus to a policy discussion of security and human rights issues, and review the Ghana Government VPs National Action Plan, will be staged in October 2016. The program’s website is underway, with completion due in coming months (see box below). The website will be a key resource for companies, communities and government alike on the VPs and how they can get involved. The website will also have a reporting portal, enabling local stakeholders to submit incidents relating to VPs-related conflict—for review and follow up by WANEP-Ghana, as part of their broader organizational work on conflict early warning/response, and peacebuilding. As part of the Ghana Government’s commitment to become a member of the Voluntary Principles Initiative, they have developed a National Action Plan (NAP) which will help deepen VPs awareness and buy-in from civil society, companies and government at different levels. During the national roundtable in July, what became apparent was the need for robust consultation with a range of stakeholders – from different ministries, to companies themselves about how they could support efforts, as well as how CSOs could also participate. The topic of VPs within a national policy level context will be explored during our next national roundtable in October, to ensure the NAP is a well consulted and sensitized document for maximum success during the government’s implementation phase. Sustainability planning for post-program continued multi-stakeholder VPs in-country process.